The safety of moving around the public space, which is a shopping centre, is ordered not only by common sense, but also building regulations. All floor coverings used must have a set of standards and approvals which allow for use in a specific place: communication, sanitary, technical, and recreational areas. the risk of slipping – therefore when choosing the tiles we take into account the anti-slip parameter marked with the letter R and the number next to it – the higher the number at the letter R, the lower the risk of slipping. 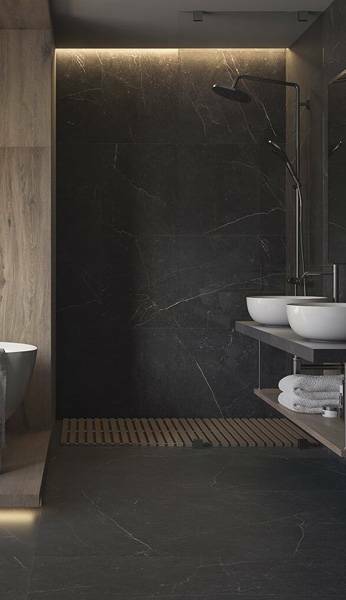 Note: Slip resistance of tiles is particularly important in the entrance zones, exposed to putting on the soles of the footwear a lot of moisture from rain, snow, and mud, therefore for these zones we recommend ceramic tiles with high resistance to slipperiness – for instance, R10 or R11. Structural Doblo Grafit Gres Rectified tiles, made in the double-charge technology (unglazed porcelain), have an anti-slip R11 parameter with “Barefoot” certificate and a deep abrasion below 175 mm 3, which makes them ideal for extremely difficult conditions, such as zones entrance to the shopping gallery. Resistance to abrasion, bending, breaking, staining, and resistance to cleaning agents – these are absolutely necessary parameters which we must take into account when choosing a floor covering for a shopping centre. Abrasion resistance, marked with the PEI symbol / number of rotations, is an indicator which in the case of glazed ceramic tiles will optimally match the floor covering depending on the intensity of traffic in the public space, such as a shopping centre. This space is not homogeneous – the zones most exposed to abrasion are obviously the entrance zones in which there is a mass of abrasive material in the form of sand, clay, mud, small stones, and sometimes even glass particles brought to the gallery’s guests’ shoes (even specialist doormats are able to collect only some of the impurities). For such entrance zones and main communication routes in shopping centres, we recommend ceramic glazed tiles of the highest abrasiveness class – e.g. PEI 5 / over 12000 revolutions, designed for floors subject to intense, continuous pedestrian traffic, with a certain amount of dirt stains. Tecniq Beige Semi-Polished Gres Szkl. Rekt. have the highest, 5th class of PEI 5/12000 abrasion resistance. An even better choice for shopping galleries zones exposed to exceptional stains will be unglazed stoneware tiles, for which the deep abrasion is determined. The more prestigious the space of the gallery, the better it is to use tiles produced in the double charge technology. This technology allows you to achieve unique visual values while maintaining the longevity of the cladding (because any possible wiping of the surface over the years is not noticeable). The double charge technology makes the tiles look impressive and unique for many years. It should also be remembered that the floors of shopping malls are usually cleaned mechanically, using heavy, professional equipment on wheels, combining the functions of scrubbing, wet cleaning, drying, and polishing. The floor must withstand these treatments, repeated indefinitely. For less used shopping centre spaces (away from the entrance zones and main communication routes), usually ceramic tiles with a PEI 4/12000, PEI 4/6000 or PEI 4/2100 rotation class are sufficient. Resistance to bending / breaking strength is another parameter which needs to be taken into account. Shopping galleries are not used exclusively by pedestrians. Increasingly, they are, for example, an attractive exhibition space for new car models (not only personal cars). They are also used extensively by parents with prams, segways and wheelchair users. The heavy cleaning machines are responsible for thorough cleaning of the floors. The gallery floor must withstand all these frequent, extreme loads. The high quality of ceramic cladding and its professional assembly will ensure durability for many years. Every day, tons of goods in customer trolleys roll over the floor of the shopping centre. High resistance to cleaning agents is another feature ceramic tiles used in the shopping centres should have because they are almost permanently subjected to the process of removing dirt (both mechanically and with the use of chemicals). The floor in the showroom has to withstand the weight of loads while presenting itself impeccably. 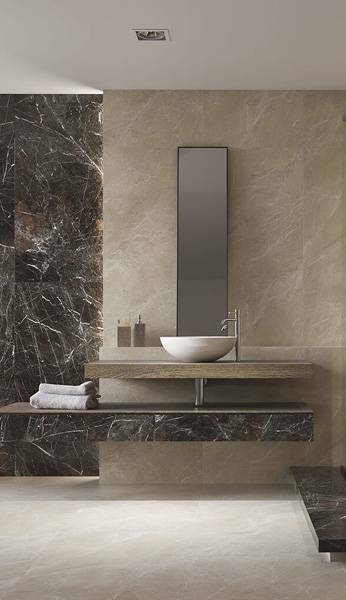 Doblo rectified tiles will emphasize the exclusive character of any interior. Ceramic claddings are a proven solution in shopping centres. They are durable, dimensionally stable, resistant to mechanical damage, UV radiation, and chemical cleaning agents. Good quality and well-assembled ceramic tiles do not cause any problems of use and care. Practice suggests that the smaller the surface of the joints, the easier it is to keep the floor clean – that is why investors are increasingly opting for collections of rectified tiles, allowing for almost uniform surfaces of floors and walls. Rectified large-format tiles combine three important features: strength, effective appearance, and usability. Aesthetics in the modern world of large-surface trade is one of the most important aspects. Most customers do not bother about the technical parameters of floor or wall claddings in a shopping centre (if they are sufficient and do not generate risks). However, each recipient is influenced by visual stimuli – regardless of whether they are aware of them or not. This is why customers have their favourite places of “shopping”, collecting inspiration or meeting friends in the restaurant and relaxation zones. Of course, the general experience of “liking” a given place consists of many components – from localisation through functional distribution, presence of favourite brands, and the character of space. Stylistic consistency and readability for gallery guests are of great importance. And in a situation where there are many branches to choose from – the game is about positive emotions of customers. Ceramic cladding – both wall and floor – should, therefore, contribute to the overall effect of prestige (adequate for the recipients of a given gallery), neatness, comfort, and space friendliness. The floor in any public space is a base which must be coherently connected with the surface of walls and interior design. In the photo: the collection of rectified Rockstone tiles. Originality is inseparable from aesthetic issues. And although the spaces of the shopping centres have, by definition, mass character, the unusual, original solutions attract attention, arouse emotions, and attach customers to a given place. One of such solutions is, for example, equipping and marking places with special elements created on special order. 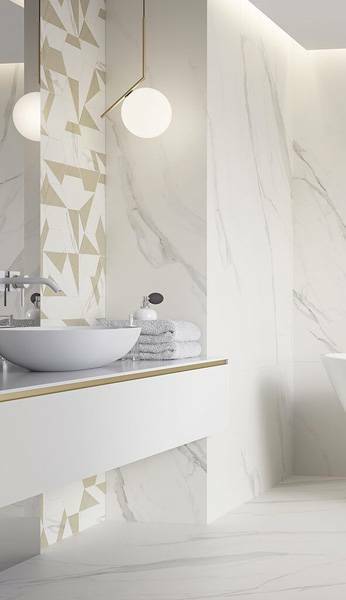 Such a treatment is also possible when working with ceramic claddings – thanks to the precise cutting of tiles (preferably in water-jet technology), you can create any patterns in them, suited to a specific place or decor. Ceramic tiles are a very plastic material – it allows to freely shape the space in accordance with the architect’s vision. In small, intensely used shopping centres venues, such as atmospheric restaurants, niche display rooms or relaxation areas, designers can use terracotta which imitates the appearance of natural wood. Such a wood-imitating floor introduces an element of cosiness and warmth, eliminating the overwhelming anonymity and the massiveness of the shopping gallery. In holiday areas, it is worth using durable glazed porcelain with the appearance of natural wood. The natural accent calms the senses of guests. Ceramic boards look no better than the wooden prototypes due to the faithful reflection of the colours and texture of the rings, and at the same time are incomparably more resistant to any mechanical and physical damage (such as dents, abrasion or dimensional changes under the influence of moisture). 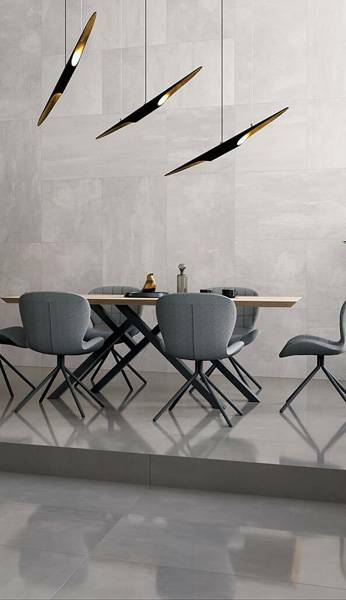 For example – rectified, glazed porcelain tiles Tammi Bianco in mat (available in the formats 29.4×180 cm, 19.4×120 cm and 19.4×90 cm), has an abrasion class 4/6000. Wood-imitating tiles are also a good choice for the office space of the shopping gallery. We wrote more about the advantages of wood-imitating tiles here. Ceramic wood will work as a cladding in the offices of gallery employees. A floor in a shopping centre is a tool in the hands of an architect who can shape the atmosphere of space, thus realistically affecting the popularity of a given institution. Floor covering in the shopping centre must be safe for users, durable, resistant to mechanical and chemical factors and easy to keep clean. When selecting specific products, the required standards must be obeyed and we should be guided by the performance parameters: anti-slip, resistance to abrasion, breaking and bending, cleaning agents, and chemicals. The appearance of the floor, like the rest of the design elements, affects the emotions of customers and their loyalty to a given place. Ceramic tiles are the artistic material in the hands of a creative architect, thanks to which they can create a safe space, consistent with their vision. When designing the space of a shopping centre, it is worth adding a bit of cosiness to the relaxation zones and office rooms, for example using permanent tiles with the appearance of natural wood.